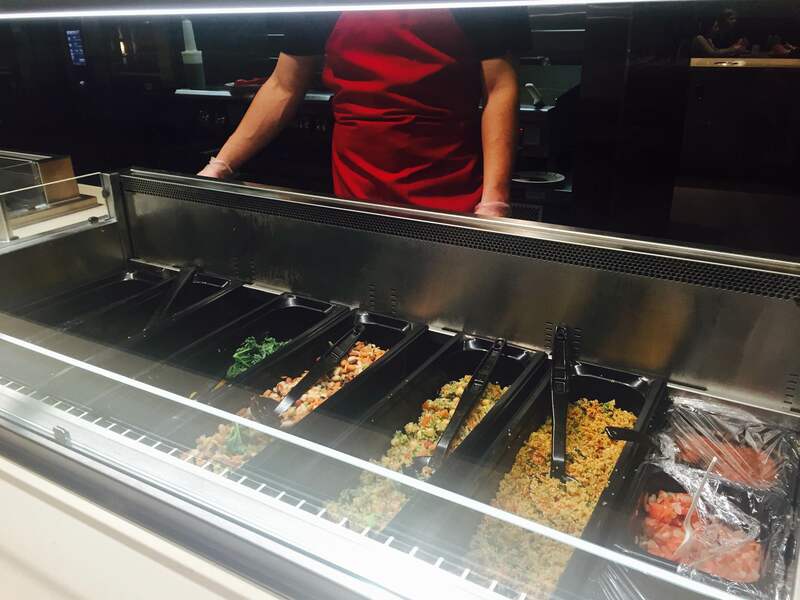 Down at the Western Dining Commons there’s been a new change in town—students can now enjoy a full buffet-style dinner, which includes access to all food stations inside. 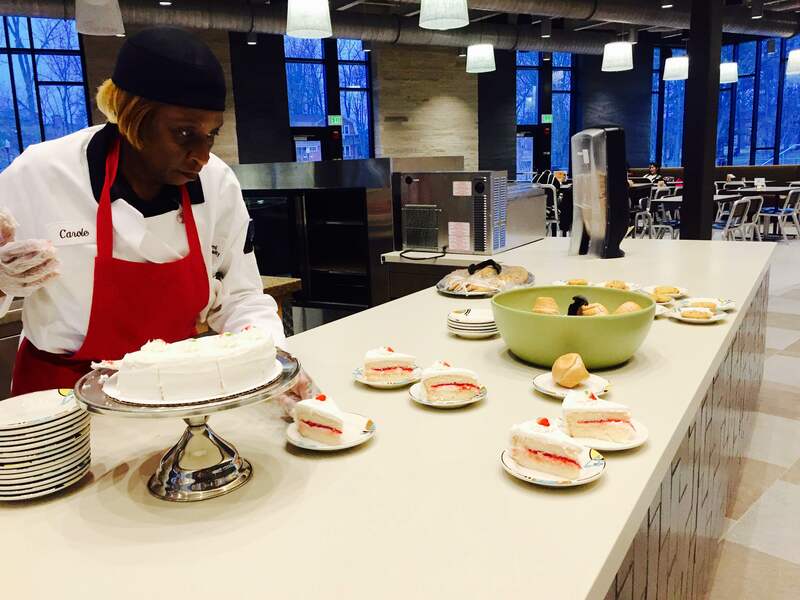 Along with the extended Allergen Free station, there’s also a new dessert station full of cake and cookie choices. Just come in, grab any hot-and-ready dishes you feel in the mood for, and eat up! When students first walk in if they head straight to the left they will have pizza choices, burgers, chicken sandwiches, and more! Also at this station will be featured any topping and condiment choices they would like, as well as sides like french fries and green beans! If students are in the mood for something spicier, they can head over to the station on the right and fill up on Pad Thai with Chicken or Moroccan Chicken (made fresh in front of them)! Beef Stew and Three Cheese Pasta are also available at this station if students are craving something that reminds them more of home. 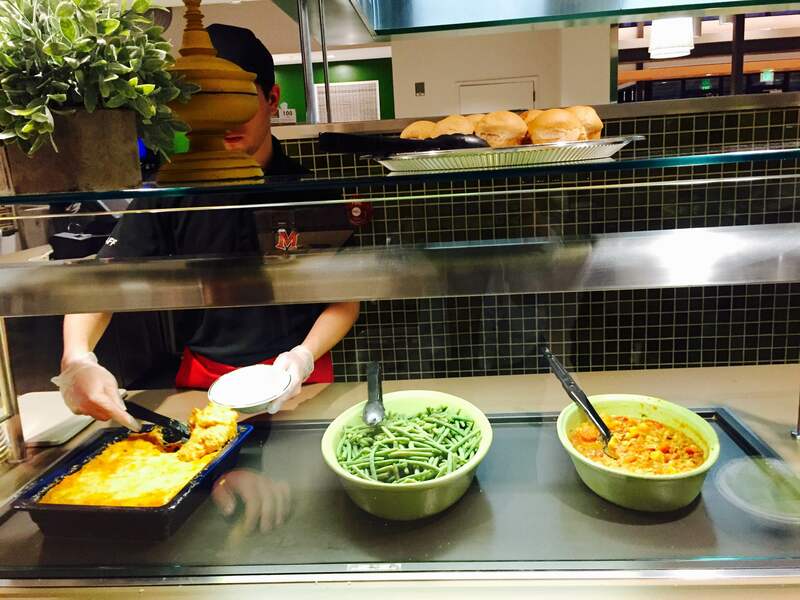 The Allergen Station features a giant carved baked ham, pasta dishes, and grilled chicken as their main courses with grilled veggies and potatoes as sides. Everything made here excludes the eight most-common food allergens. Everyone is able to enjoy this ultimate feast! Last, but certainly not least, is the new dessert station located on the bottom level. Each night features a different dessert which is typically cakes and pies dish with cookies! These all come pre-sliced and plated so it’s easy to indulge in all the goodies available! So come #EatWithUs and stuff your faces 🙂 no judgement here, with all the different choices there’s sure to be something that catches your eye! Maplestreet Station is relatively new as of last fall, and with new developments come experimentation and adjustments to bring about improvement. I heard that the Delish menu changed over break, so I decided to check it out. 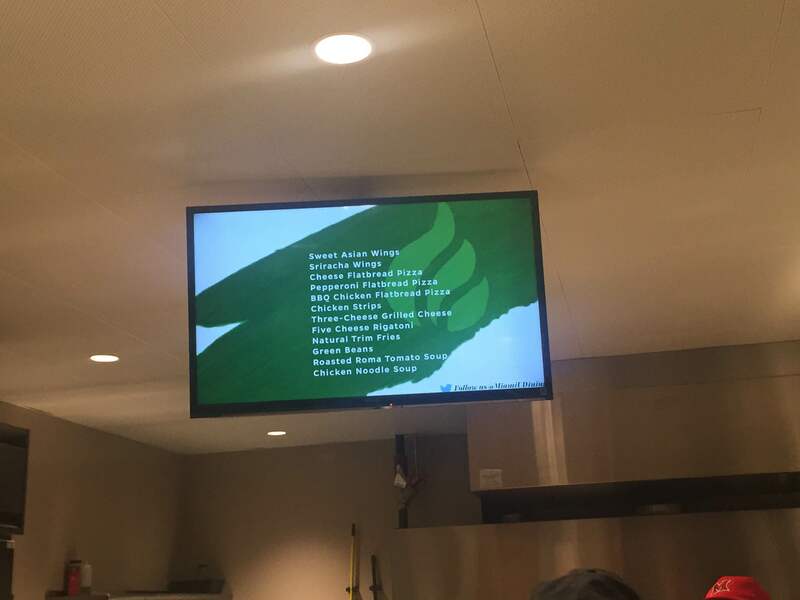 The first change I noticed was that while students can still choose from eight unique sandwich options, they also have the option to completely customize their own sandwich—kind of like how Encounter’s burgers work. The menu offers a myriad of bread, cheese, meat, sauces, and additional topping choices. In fact, other students in line with me agreed that they found this menu easier to order from. Instead of ordering an already established menu item sandwich and having to switch out the bread or meat choice to get what you desire, you are now able to pick exactly what you want without any hassle. In my opinion, the Delish menu is better than ever, and I would recommend checking it out for yourself! Want to be a guest blogger? 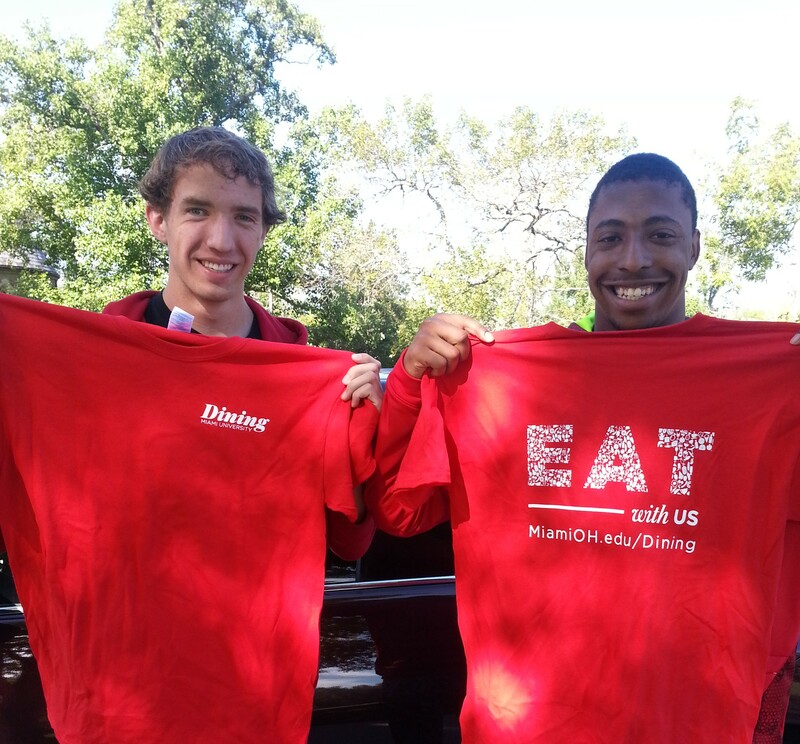 Email davishmd@miamioh.edu for more information. Have you heard anything about Miami Dining’s pumpkin milkshakes? Yeah, I saw a sign for it. I’m so ecstatic to try one. I’m interested in seeing how they will incorporate pumpkin in milkshakes. There’s a light pumpkin taste. It definitely doesn’t taste like liquid pumpkin pie. The flavor isn’t overwhelming at all. It’s just enough pumpkin! And the milkshake has a good texture. How do you feel about the use local pumpkin in the milkshake? Oh, I think that’s really great. I like that a lot of what Miami dining uses is pretty local. It makes the seasonal milkshake idea even cooler. The ingredients aren’t store-bought, they’re from down the road. Did you know that the ice cream is local? No, but I’m happy to hear that! Yep, the ice cream is from Young’s Dairy in Yellow Springs, OH. What flavors do you detect? Pumpkin, obviously, but there’s a bit of a French Vanilla taste too. Are you enjoying your local pumpkin milkshake? Yes, I’d definitely go back for more this pumpkin season! 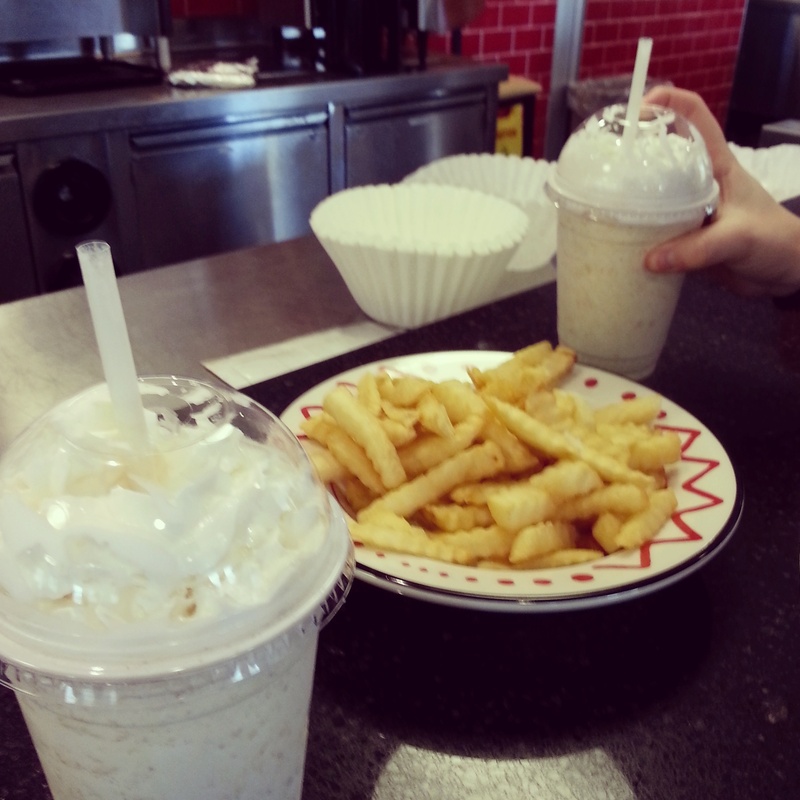 The salty/sweet combo of the milkshake and Pully’s fries is amazing. Local Pumpkin Milkshakes are now served at Encounters and Pulley Diner. The ultimate combo is this milkshake and a plate of fries. Take our word for it. Peabody RA, Andrea, gets interviewed about her super experience at Super Brunch. Is there one quote you’d want someone to take away from your experience? Have you heard anything about this event? If so, what? So because of that I was excited. I’m excited to see how much they have to offer. I think I might be most excited for french toast, that’s my favorite. I’m looking forward to free refills on drinks too! 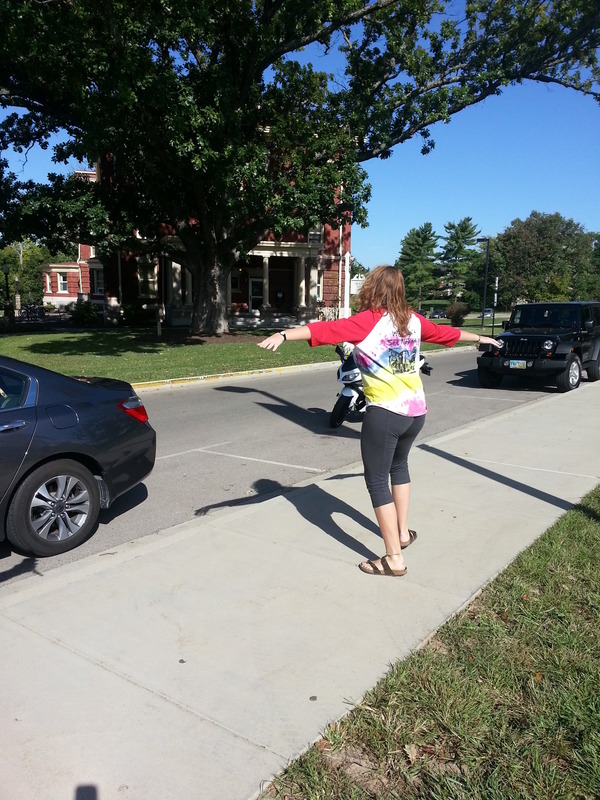 Walk from Peabody to Western Dining Commons. While you’re walking please count the amount of wingspans it takes you to get from one place to the other? It might help to pivot your feet to do this. Describe the first thing you smell when you walk into Super Brunch? The eggs and potatoes. Smelled familiar and inviting. 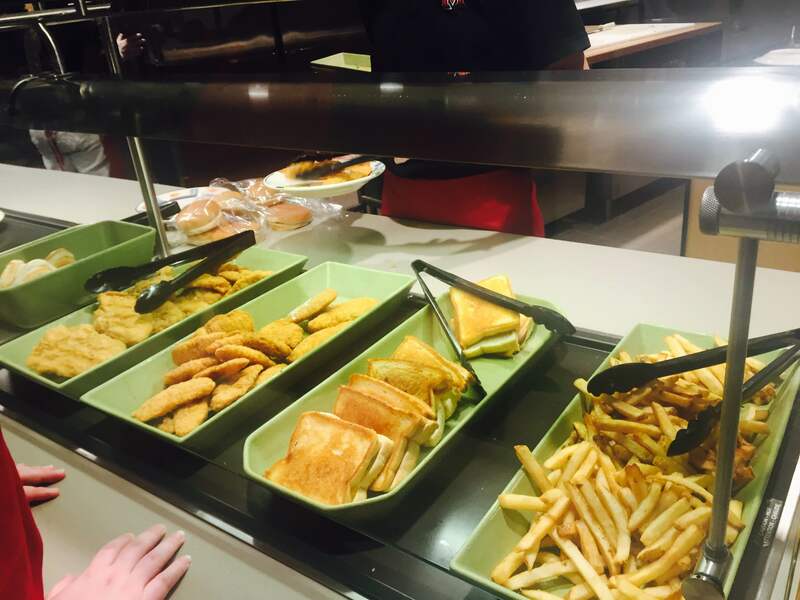 Were you able to find a variety of breakfast options? or Were you able to easily navigate through your choices at each station? Yeah. There were so many options, I didn’t get a chance to try them all. Next week I can eat something that I didn’t try today. How is this brunch compared to 1809 (assuming you’ve had the 1809 brunch)? Lavish, like 1809, and really good quality. Crepes are a must. I would only eat crepes at 1809, so it was really critical that Super Brunch served crepes too. That might be one of the options I try next week. Are there any comments on Super Brunch that you’re hearing while you’re here? What is the food you are most enjoying? Why? I’m enjoying the breakfast potatoes with the peppers and onions and I like the mushrooms and onions in the eggs too. I like the variety. I like vegetables, I like omelets. Combined, it is awesome. The variety adds some nutrition to my regular diet. 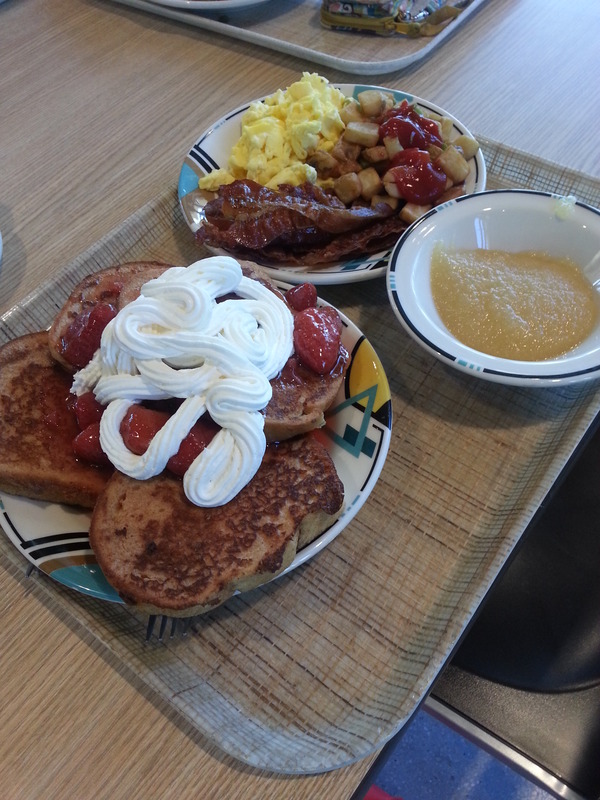 Overall, how is your dining experience been at Super Brunch? Positive. I’m pleased with the options. I wish it was like this every day! Good variety, good space, and I enjoyed seeing a lot of people there in the morning. I like that it’s a new thing I can try on campus and because I can customize my options, I can eat something different every time I go. How many students are still in pajamas while eating here? What’s the most unique pair of pajama pants you can see? People are pretty casual here. Maybe not PJs, but pretty much every other student was dressed like they just woke up. 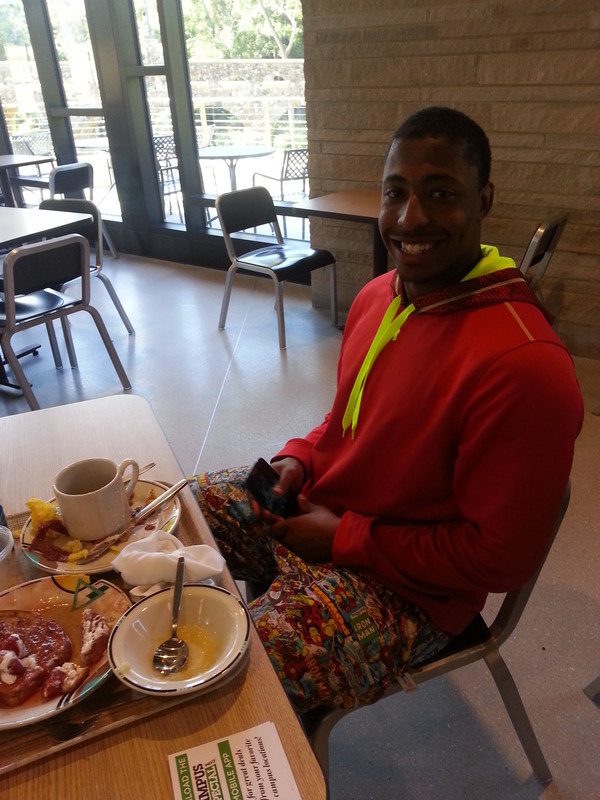 Lots of comfortable clothes at Super Brunch today. Actually, my friend, Albert is rocking the most unique pair of pajama pants I’ve seen here. Iron Man PJs. There is a lot of hype about this place, especially the burgers, and it definitely lived up to the hype. I love how customizable the burgers are too. I for sure am coming back. Have you ever eaten here before, Taylor? I’ve only had a milkshake here before now. It was chocolate and really yummy. I stopped by because I was visiting my friend who works here, so I got to enjoy my milkshake while chatting with my friend. The Encounter burger. Antibiotic and hormone free, a third a pound of local beef from Oxford’s Reserve Run Farms, according to the menu! I’m really excited for the burger! I’ve heard good things about these burgers. How would you describe this restaurant, in a word? Retro, but also modern. I see the comic art which is so retro and cool, but then I see the people and the food and that is all modern. It’s retroly modern, if that makes sense. There’s lots of natural light through the big windows too, so it’s a nice place to escape the heat, but enjoy the beautiful campus. 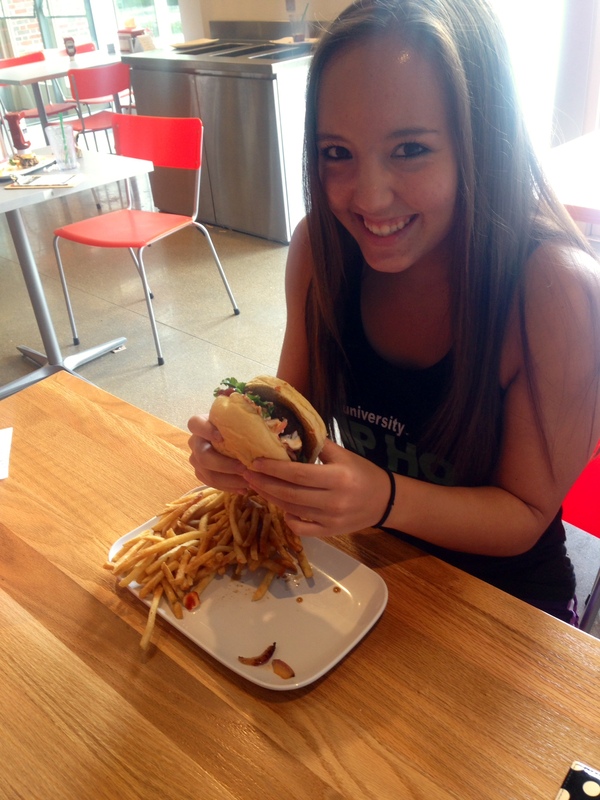 Now that you’ve gotten a chance to take a bite, how is your burger? It’s good. The onions have some spice to them. It’s actually really good. I like how the server asked if my order looked right when she delivered it to me. That was a nice touch. Yeah, it’s a really good sit down restaurant. Along with the food, I like the vibe of the music—it’s current and not too loud. It’s a good place to hang out with friends. 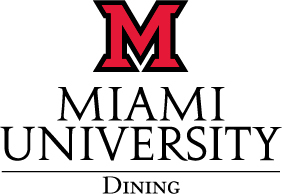 If you were to compare this restaurant to another restaurant off campus, what would that restaurant be? It reminds me a lot of Johnny Rockets. The decorations are similar and the American-style food is also really similar. One of the differences between the two is that Johnny Rockets has a jukebox that you have to put a quarter into to the pick the music, but the music at Encounters is more current, not to mention free!